SANAA, Yemen (AP) — Street battles raged on Sunday in several areas of Yemen’s contested port city of Hodeida, where a U.S.-backed, Saudi-led coalition is trying to drive out Iran-backed Shiite rebels, officials said. They say airstrikes from warplanes and Apache attack helicopters shook residential neighborhoods throughout the day, while ground forces clashed around the university in the city’s south, as well as al-Thawra and May 22 hospitals to the east. Residents said they heard heavy gunfire and saw smoke rising from both areas, with several military vehicles on fire near the university. Intense fighting around al-Thawra Hospital blocked access to it for hours, while rebels retook the May 22 hospital after it fell briefly to the coalition, they said. Photos of damaged hospital buildings have been circulating on social media. Closer to the port facilities, the gateway for vital humanitarian aid, rebel gunmen occupied one the country’s largest flour mills and posted fighters on its rooftop, one official added. He said efforts are ongoing to evacuate workers inside the site he feared could now be targeted by airstrikes. Medical officials in the southern port city of Aden, a coalition stronghold, say some public hospitals there have reached capacity from a steady flow of war wounded from contested fronts across Yemen, and are refusing to accept new patients except for some civilians with critical wounds. All officials spoke on condition of anonymity as they weren’t authorized to brief reporters, while the residents did so for fear over their safety. The conflict in Yemen, the Arab world’s poorest country, began with the 2014 takeover of the capital, Sanaa, by the rebels, known as Houthis, who toppled the internationally recognized government. 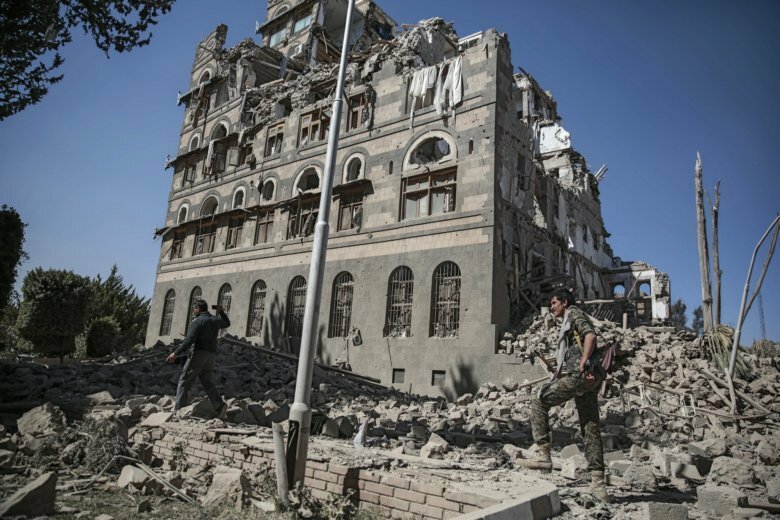 A Saudi-led coalition allied with the government has been fighting the Houthis since 2015 in an attempt to restore the mostly exiled government to power. The war has killed an estimated 10,000 people, and left around two thirds of Yemen’s population of 27 million relying on aid, with more than 8 million at risk of starvation. Doctors have reported several civilians including children killed since the latest offensive on Hodeida began on November 1, shortly after the U.S. called for a cease-fire by the end of the month.